It’s turning out to be quite a superb year for Samantha. After teaming up with Suriya in Lingusamy’s Anjaan, the latest news is that A R Murugadoss has roped in Samantha for his next project with Vijay. There were plenty of rumours last year that the actress might team up with Vijay and now, it seems to have become a reality. 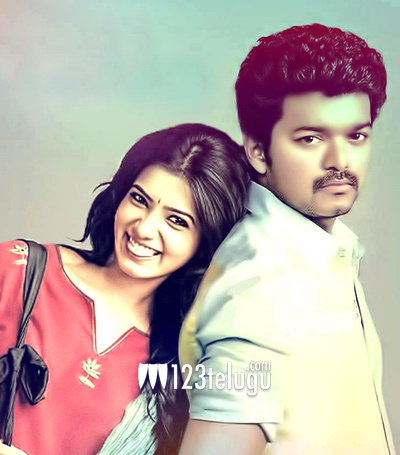 This untitled film starring Vijay and Samantha was officially launched earlier today in Kalighat temple, Kolkata. Vijay and A R Murugadoss had earlier teamed up for Thuppaki and it went on to become a blockbuster. Naturally, expectations on this untitled film are sky high. Anirudh Ravichander is going to score the music and George C Williams is the cinematographer. The film is being produced under Lyca Productions Pvt Ltd banner. On the other hand, Samantha is also reportedly in talks with Trivikram Srinivas for his next project with Allu Arjun. She’ll soon be seen in Manam, Autonagar Surya and Rabhasa which are slated for release over the span of next few months.